This beautiful gold container with swirls, stars, french horns, and Christmas tree graphics, is filled full with everything nestled in silk evergreens. Wrapped in crisp clear cellophane and topped off with a gorgeous gold handmade bow. Includes a Handwritten Greeting Card. 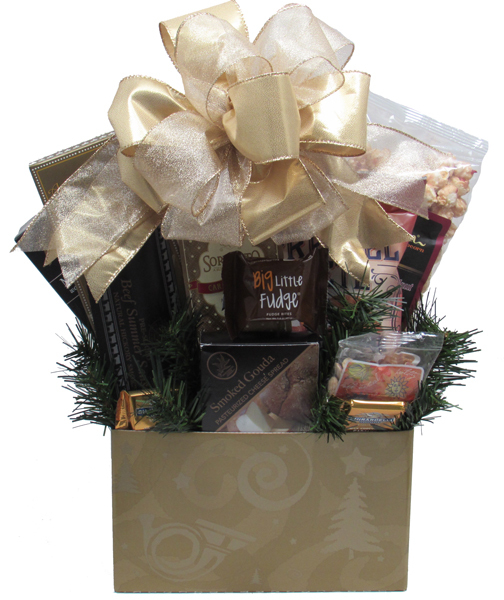 Christmas gift baskets make the perfect gifts! 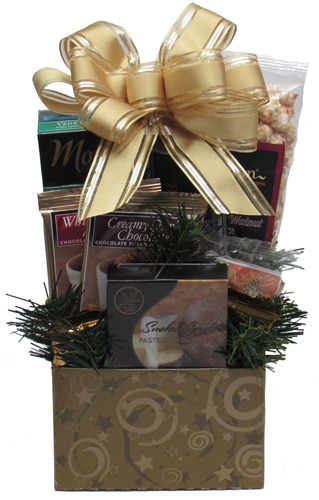 LARGE: Filled with Ghirardelli Milk Chocolate with Caramel filling Squares (2), Nuts, Cheese (Asiago Garlic or Smoked Gouda), creamy Big Fudge Bite, Gourmet Popcorn (Cranberry Walnut Crunch, Chocolate with Sea Salt Crunch, or Pecan Almond Crunch), box of Angelina's Sweet Butter Cookies, Sorrento Cocoa or Mocha, Natural Hickory Smoked Sliced Beef Summer Sausage, flavored Pretzel Twists (Smoky Barbecue), Water Crackers, and a of box Peanut Brittle. Finished decorated design for hand delivery approx. 18"h x 10"l x 7"w.